^ "The Jerusalem Post (Israeli newspaper)". Encyclopædia Britannica. Retrieved 21 November 2013. ^ "The Israeli Press". Jewishvirtuallibrary.org. Retrieved 8 June 2013. ^ Mel Bezalel (7 May 2009). "'The truth is louder than TNT'". 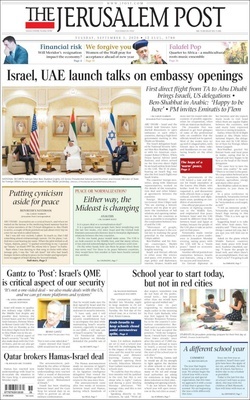 The Jerusalem Post. Retrieved 21 November 2013. ^ "Ivrit". Jpost.com. Retrieved 8 June 2013. ^ "Horovitz steps down, Linde taking over as JPost editor". The Jerusalem Post. 12 June 2011. ^ "Jpost.com Site Info". Alexa.com. Retrieved 21 November 2013. ^ "Yafo 206, Jerusalem, Israel to HaAhim MiSlavuta 13, Tel Aviv-Yafo, Israel - Google Maps". Maps.google.com. 1 January 1970. Retrieved 21 November 2013. ^ "Pqarchiver.com". Pqasb.pqarchiver.com. 2 March 2008. Retrieved 8 June 2013. ^ "Horovitz steps down, Linde taking over as JPost editor". Jpost.com. Retrieved 8 June 2013.